Since their humble beginnings making longboards in the backyard of a house in La Jolia, California back in 1993, growing until their subsequent buyout by Billabong International in 2008, Sector 9 has grown into what is arguably the most influential skateboard company when it comes to the world of longboard skateboarding. So influential in fact, that some of the biggest pro stars of skateboarding such as Mike Morissey, Gavin Beschen, and Joel Tudor are sponsored by Sector 9. The Sector 9 Revolution Complete continues this tradition of making the best longboards they possibly can. The Sector 9 Revolution Complete is part of as well as the largest deck in the Bob Marley line of longboards they have made. Despite the fact that the Sector 9 Revolution Complete is the largest in this line, it is not the largest longboard Sector 9 makes. That is not to say it is short, however, measuring in at a hefty 40.5” long. This is plenty of length to give you some really nice, deep carves, as well as a fast and smooth ride. The Nineball 70mm wheels, also made by Sector 9 are well made, big and thick, and not so soft that before you know it you are down to 30mm wheels. It is a marked difference from a lot of other complete skateboard decks where you typically get the cheapest, softest “starter” wheels. The biggest downside to this board is the fact that it is a Bob Marley board. It’s great if you really love the music of Bob Marley, which there is nothing wrong with because he was great – but there is something incredibly trite about a skateboard with Bob Marley all over it. Like the suburban kid who has never smoked pot, works at Cold Stone Creamery and has his room covered in Bob Marley posters that he recently purchased to replace his Yo Gabba Gabba posters that he outgrew. Attaching stereotypes aside, truly the worst part of the graphics is how uninspired they are. The bottom is acceptable enough. A nice collage of pictures of Bob Marley, with a few bits of spot color. 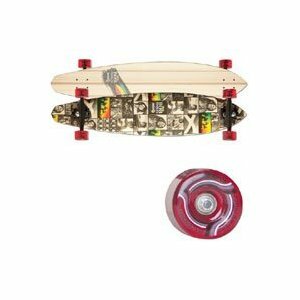 The top is simply plain wood, with Sector 9 grip tape and a singular strip across the board very near to the tail with the colors of the Jamaican flag. The uninspired graphics of this longboard makes the entire Sector 9 Revolution Complete look like a cynical marketing attempt to cash in on the name of such a legend rather than a fitting, inspired tribute to a musician who deserves to be immortalized with a fantastic design to complement the music that has inspired millions. Sector 9 makes high quality longboards, and the Sector 9 Revolution Complete, from a pure skating perspective, is no different. However, unless Bob Marley is your absolute favorite musician of all time, there are other boards better suited. This board is currently priced at $169.99 on Amazon.com. This entry was posted in Reviews, Sector 9, Skateboarding, Skateboards and tagged Bob Marley, Longboard, Sector 9, Sector 9 Revolution Complete. Bookmark the permalink.